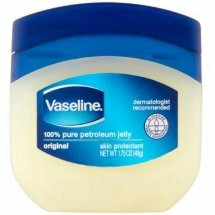 Petroleum Jelly, OriginalMisc: Protects minor cuts & burns. 100% pure petroleum jelly. Skin protectant; triple purification; purity guaranteed. Guaranteed purity for soft, smooth and visibly healthy skin. Vaseline - keeping skin amazing. Learn more about skin at vaseline.com. Misc: Protects minor cuts & burns. 100% pure petroleum jelly. Skin protectant; triple purification; purity guaranteed. Guaranteed purity for soft, smooth and visibly healthy skin. Vaseline - keeping skin amazing. Learn more about skin at vaseline.com.